With Spring drawing to a close, the soaring temperatures and warm rays of sunshine beaming through the tall trees are making way for the Summer. And with Summer comes another Test Realm! On the last episode of KingsIsle Live, Community Manager Tom Purdue and Senior Producer Leah Ruben covered some of the new content coming this Summer to Wizard101! The dawn of a new PvP era is upon us, Wizards, because PvP is being revamped! According to KingsIsle, a new turn-based mode will be introduced to Wizard101 Tournaments, most likely this Summer. This new mode is a chess-based turn system, similar to the one that's already in place in Pirate101: one side casts a spell, while the other waits for their turn to select a spell and cast it, and so on. The new system will be implemented in Tournaments at first, and might be applied to all PvP in a future update. You can watch the video here. Additionally to the turn-based system, Dispel Shields will now be added to your target whenever you cast a Dispel on them. This will address one of the biggest problems in the current max level meta: the dispel spam. The June 2017 Newsletter suggests that we will now be able to add emoticons to our chat messages, as shown in the gif below. What do you think of these changes? 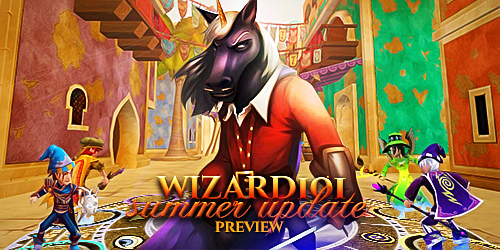 Are you excited for Wizard101's Summer Test Realm? Leave a comment below and let me know!